Not many people carry a presence that rivals that of the NFL, but John Madden is certainly one of those people. And now the league's grandest stage may be without one of the game's grandest ambassadors. With the NFL now bringing in more than $10 billion in annual revenue, very few can stand toe-to-toe with pro football when it comes to popularity. And this year, one of those very few won’t be in attendance for the buildup to one of the biggest sporting events on the planet. "He’s on his way back. He’s just not there yet," Madden’s son Mike told the paper on Wednesday. "He could rally and make appearances, but he’s choosing not to do so." 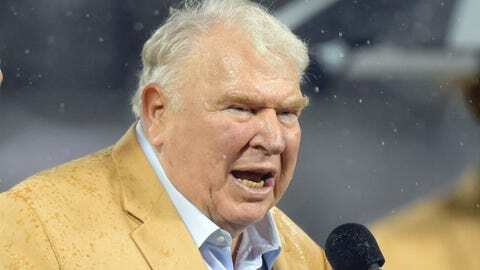 The two most noteworthy events Madden will miss are Thursday’s Legends for Charity dinner, where Madden is to receive the Pat Summerall Award, and Friday’s Pro Football Hall of Fame luncheon, which is also scheduled to honor Madden. The Pat Summerall Award is named after Madden’s longtime broadcast partner, and Madden’s sons Mike and Joe will represent him at both events, the report said. "I got a nice note from Coach. It was great to hear from him," Rivera told the media of Madden on Wednesday. "The biggest thing more than anything else is he’s told me to stick to my gut, stick to what I believe in and stick to what I’m doing."